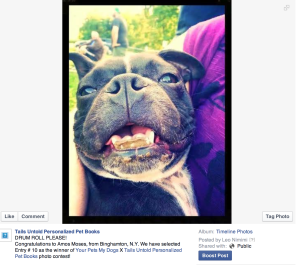 DAWN: Another wonderful testimonial from a Tails Untold® Personalized Pet Book Customer. KEITH: We are so excited to receive this wonderful testimonial from another happy Tails Untold® Personalized Pet Book Purchaser. Trudie’s Book, as all of our books, are always fun to create. We become friends with the Pet Parent(s) and get to know their petkid(s) in a fun and warm way. We just had to share. “Today, I received the book I had made for my fiancée, Amanda and Trudie The French Bulldog. Trudie and I had to wait for ‘Mamma’ to go back to work to look at it and we are thrilled with it! The time and effort Susan took in getting a confessed technophobe like me to source my photos from those I have of Trudie and even one of Amanda and I was astonishing. So patient, helpful and understanding, I was overwhelmed by the care taken and therefore delighted but not surprised by the high quality product that came out of it. The book is wonderful and even the thought of the most special person in my life seeing it makes me smile, such is the way the information gathered has been woven into the book’s content. Thank you so much for the hard work. It is a superb product we will enjoy a great deal and one you should be proud of. 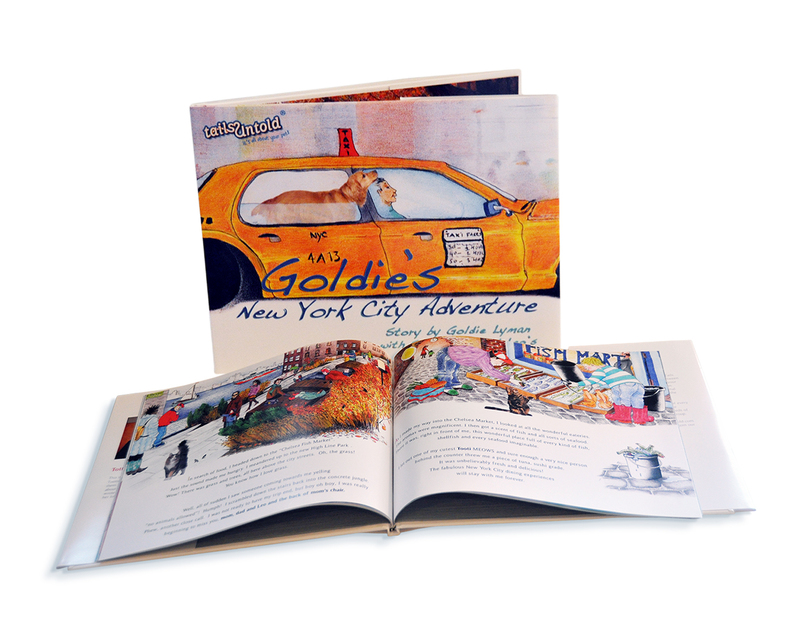 PS: If you are interested in a Tails Untold® Personalized Pet Book as a gift for the Holidays, please order now to be sure it arrives in time! 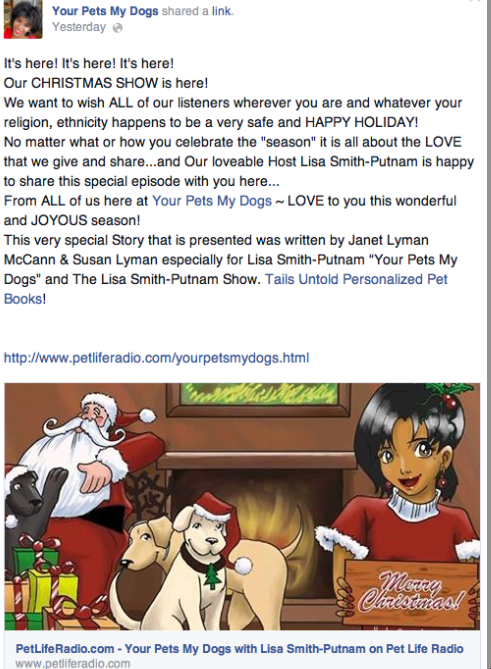 We’s so excited to let you know that Tails Untold Personalized Pet Books Sponsored Lisa Smith-Putnam’s Your Pets My Dogs Christmas Story on Pet Life Radio. You can listen to MacDuff’s Christmas Surprise Story narrated by Janet Lyman McCann and hear special Christmas Memories from Lisa, Bill, Janet and yours truly. Come grab a hot chocolate, cup of tea or your favorite drink and enjoy the show. Please share with all your friends! We also appreciate any comments. 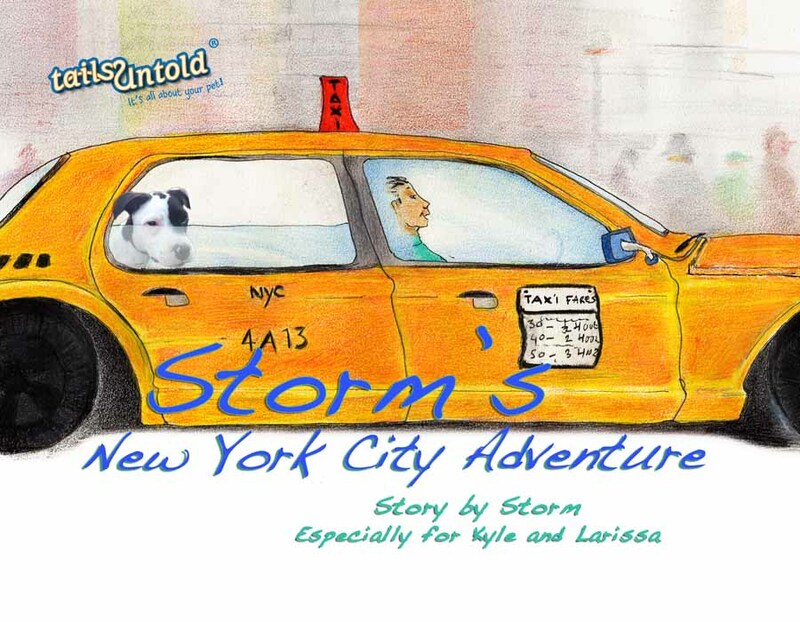 And here is a picture of the cover of the Tails Untold Personalized Pet Book “Macduff’s New York City Adventure Book” from “Santa”. Tails Untold Personalized Pet books and Your Pets My Dogs Facebook Photo Contest Winner is Amos Moses from Binghamton, NY. We had lots of wonderful entries but Amos, Entry #10 won. He is the lucky winner of his very own Tails Untold Personalized Pet Book, Amos Moses’ New York City Adventure. We can’t wait to create his book. Check out our Facebook page https://www.facebook.com/TailsUntoldBooks as we have lots of fun gift, treat, and great functional items for your pets. Also check out Lisa Smith-Putnam’s Facebook page https://www.facebook.com/YourPetsMyDogs and listen to her radio show, too. Also, a reminder, if you are looking for a unique and special gift for a family member or friend, please check out www.tailsuntold.com. We create one of a kind, personalized to “your pet”, beautifully illustrated keepsake books! Your pet is the narrator and the star. 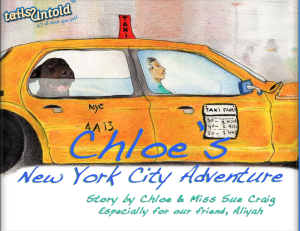 Each illustrated page has your pets photo and personal information strategically inserted to create your very own one of a kind, special personalized book! Order now to be sure and receive your book for the holidays or purchase a gift certificate. We are very excited to share this interview about Susan Lyman, Tails Untold Personalized Pet Books creator. Lisa Smith-Putnam interviewed Susan for the Lisa Smith-Putnam radio show called “Your Pets My Dogs”. It is also featured on iHeart Radio! Come and enjoy! And as Lisa says: Laugh, Share, Play! 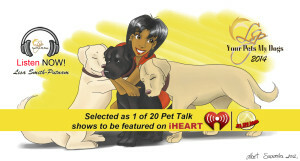 Update: Today I found out the interview is also on Pet Life Radio…Woof Woof! Here is the link and please feel free to share! I got the book today. Thank you so much, it is amazing! You did a lovely job, thank you, again. Larissa from Australia.